Over the eight and a half years that Misadventures with Andi has been around, I’ve had a lot of people ask me about what blogging tools I use to make the magic happen. To be honest, there are two parts to the answer. First, trial and error. Eight years is a long time and the tools that are available today – to do just about everything – weren’t always there. I’ve used a lot of tools, both paid and free, and despite the fact I’ve got it narrowed down to a system that works for me, as the space continues to develop, I know I will be adding and removing more! Secondly, working professionally in social media and content marketing, I get access and exposure to tools that I can then use for my personal blogging. 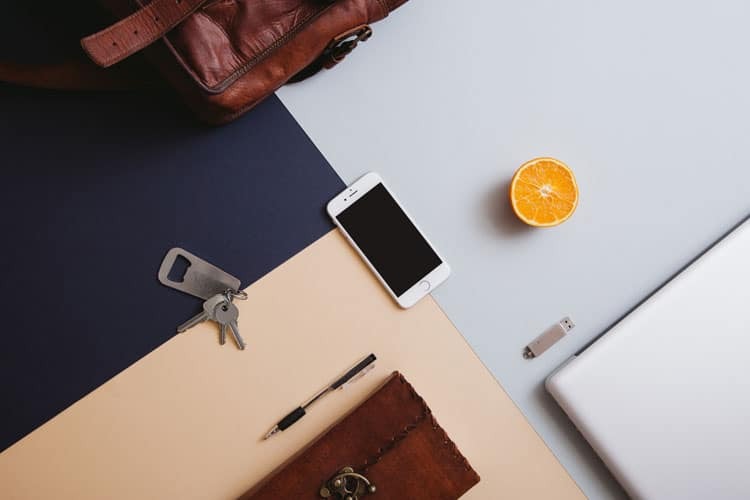 Although some tools remain at the enterprise level, not for single bloggers like you and I, there are often smaller scale versions of the tool or a competitor that I can use. Perks of the job! So with that as a background, here is my set-up. 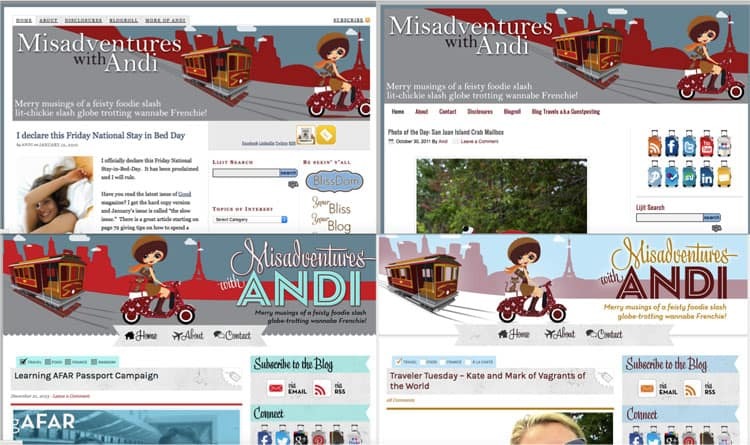 When Misadventures with Andi first began I knew absolutely nothing about blogging. I had taken a creative writing course, exploring the various mediums for writing and fell in love with blogging. I Googled blogging and because it was Google, I got Blogger/Blogspot results. So I signed up for a Blogger account. I very quickly figured out that the platform was not going to keep up with my needs and I decided to make the move to WordPress.org. I had been blogging a little over a year so it was a scary proposition to migrate and rebuild my site. That’s when I was introduced to Shauna. Or the magic lady who makes my site run. Shauna migrated me over, and designed my original site. Shauna and her husband own a design, development and hosting company, a boutique business called Servously. Despite using (and loving) Shauna, I didn’t host with her. At first. But after many bad experiences with other hosting companies, I came into the loving arms of Servously. And I’ve never looked back. In the many years I’ve been with Servously, I’ve rarely been down and Shauna is an email or Facebook post away. She is very responsive and friendly. I know there are a lot of large hosting companies out there, but I am sticking with Shauna. While not quite hosting, I do also use Cloudflare, a tool that aids with speed and security. In addition, it caches my site so if it does happen to go down, the majority of time the pages are already cached and reachable. Lastly, it blocks spammers and attackers. Best of all, most of the basic features are free, although I use a paid version ($20/month). Misadventures with Andi Design Changes through the years. Word of caution. You have to be careful with the designers that you engage with online. In eight years time, I have been scammed twice. Once where I got my money back and once where I did not. Make sure you get references and look up any online reviews. Even the best of us can be duped! To validate that my design is not only “pretty” but also easy to navigate, I use Peek User Testing. I discovered it when the internal UX team at the last company I worked at used it to test a marketing campaign idea my group had. You can test your site three times every month, best of all it’s free! I am a Certified Usability Analyst, a fancy word for understanding the usefulness or usability of something, in my case, websites, so I absolutely love this tool. I tweak things here and there based on the results of my testing. I also like to check in with my readers directly. Since 2009, I’ve had an annual reader survey. Most of the time I have used SurveyMonkey to design the questionnaire, but this past year I tried out TypeForm. TypeForm is free, at least the version I used, and very robust in terms of flexibility. I’ve paid for upgraded features in SurveyMonkey in the past, but it looks like TypeForm is a better replacement for what I need. 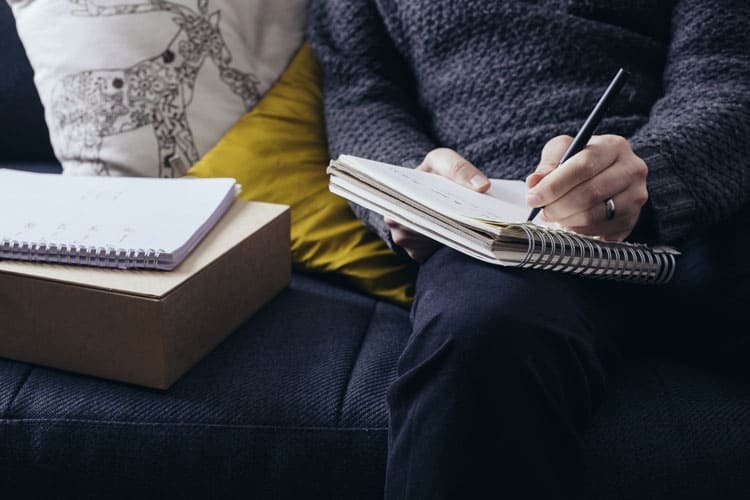 I use the notebooks for blog post ideas, mind-mapping, in-person interviews, things like that. But to keep track of my blog posts past and near future, I’ve been using Google Calendar for a long time. I can go back to May 2009 when I started using it and see every single blog post I’ve ever published Plus I map out future blog posts as well. I have the WP Editorial Calendar plugin and I’ve also at various points off and on had CoSchedule, but I always had Google Calendar in the background so now I’ve abandoned the rest and just use that. I also use Evernote for research notes and email templates. It’s a very robust tool and the free version is perfect for my needs. And since I am often waiting on Mr. Misadventures to take photos in some remote location, I often use the Notepad on my phone to write posts and notes. 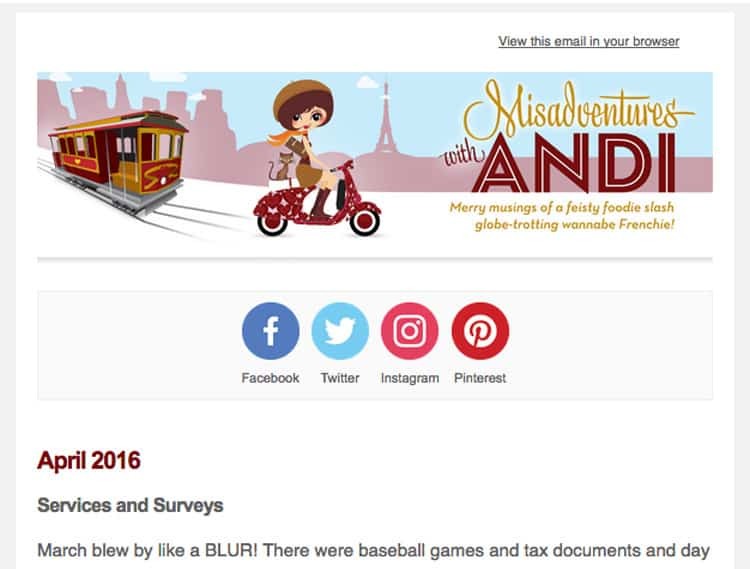 A Misadventures with Andi monthly newsletter. Whether you subscribe to receive my blog posts via email or have signed up to get my monthly newsletter, the tool I use to deliver both items is Mailchimp. I tried Constant Contact first, a very long time ago, and was disappointed with its design capabilities (I’m sure it is more robust now). I wanted more help with the design aspect and Mailchimp was so easy to set-up and use. I’ve been using it for many years and really like it. The brand is invested in helping you create good email content and they take adherence to CAN-SPAM laws and security seriously. If there is one thing I wish I did a better job of when I started out, it’s doing a better job building my email list. I will be focusing more on that in 2017 as well as trying to be more consistent with my newsletter. As part of my list building effort, I may look into ConvertKit as a vehicle for delivering materials. But I am not sure yet. A lot of the blogs that I sign-up for seem to be using it and the process feels seamless, but I’ll have to let you know in a follow-up post. So you probably know that the same thing applies to blog posts. In order to drive traffic to your blog, you need to use tools like social media. 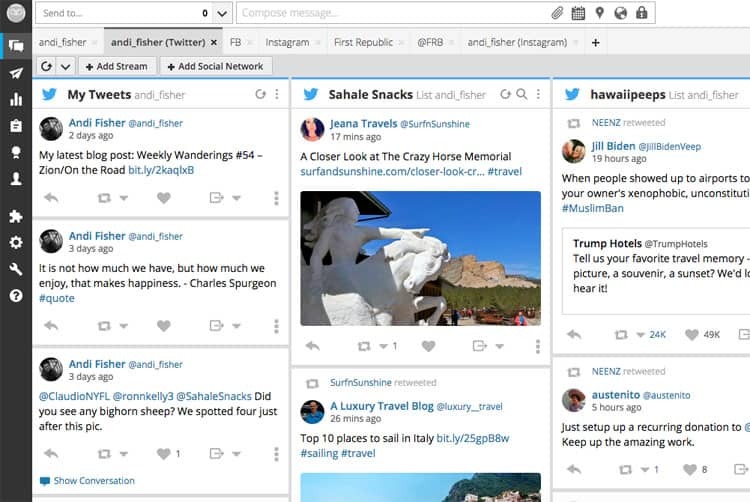 To organize my social media, my tool of choice is Hootsuite . I don’ know how I stumbled upon this platform, all I know is that I’ve been using it for about seven years and it’s fabulous. I brought it to Dolby for my team there and would have used it at the bank if it weren’t for a few issues with other internal tools. With Hootsuite I can schedule out tweets, Facebook and Instagram posts. I do that a lot when I have sponsored projects to ensure that I promote them as much as possible. I’ve found I can have the best intentions for posting content but life, meetings or a lack of wifi can wreck havoc on my plans! I can also respond to tweets and track lists based on a keyword or group of people. For scheduling Pinterest posts I use Tailwind. This is a very powerful tool but I am only using a few of its capabilities. I will be diving deeper into this excellent blogging tool this year. When I find myself with extra time, or frankly when I’m super organized and make the time, I use Tailwind to curate Pinterest content. For other social media channels, I use Buffer. I’ve also used this tool for years and love it. I use it mostly for Twitter, LinkedIn, and Facebook. They have Google+ but only for personal pages, not for a business (or blog) page. As I’m reading things online that I feel like sharing, I just add it to my Buffer queue and I’m done. It spaces out the content I want to share so I’m not sending out too many updates at once. I did have a tool that was essential to my online life that recently sunsetted. I used it to automatically tweet out new blog posts from hand selected bloggers who consistently produced great content. I was very sad it doesn’t exist anymore and but have now discovered dlvrit which does exactly what my old tool does! I set up my account with bloggers whose content I love and when they publish a post, it automatically gets tweeted. One writing tool I recently discovered and am now OBSESSED with is Grammarly. It’s a site and a plug-in that corrects your grammar as you write and I love it! It has helped improve my comma usage like crazy. I love to geek out on the weekly reports that tell me how much I’ve written and what my most common mistakes are, in this case, commas! When you are trying to showcase your work to brands or even perspective employees, your writing better be error-free and Grammarly definitely helps with that! I’m using the free version, but they have a paid version as well. Also when I write posts that contain affiliate links, I use Pretty Links because those links can look really gnarly! I prefer something that is much cleaner. It’s a WordPress plug-in that creates a branded URL that masks the ugly affiliate URL. Traveling in an RV over the last year has given me a real appreciation for a stable wifi connection! I will never take that for granted again. When I found myself in a sticky situation needing an internet connection, I turned to Karma. It really saved when I had deadlines with brands and I was desperate. It’s a mifi device that I use to connect to local LTE networks. I buy data as I go (rather than have a monthly plan which they offer as well. You may wonder what is the foundation that the Misadventures with Andi site is built on. You know my CMS (content management system) is WordPress. My site is designed and developed by two great peeps. It is hosted by a boutique hosting company. And I’ve shown you the editorial, content and social media tools I use. But what is the framework underneath all that making it run? My site runs on Genesis Framework from StudioPress Site. I was lucky in the early days of my blog to stumble upon CopyBlogger. I got to meet the founder, Brian, at a small B2B blogger conference I attended in 2010 and was sold on everything he said and wrote. He is definitely one of my earliest influencers. From the moment he launched StudioPress I was in. How about you? Do you have a blogging tool that you love? Do tell! Have a question about one I use? Let me know! I have been using Tailwind as well. In the last 6 months I’ve went from 400 followers to 1200 and growing every day. But as a part-time blogger who has a full time job who doesn’t always have the time to actively pitch and seek out extra curricular work sometimes I ask myself why I am so invested in my blog and numbers to begin with? In 2017 I am hoping to more actively put my blog to work for me. I want to travel but want to be paid for it or at least have it comped in exchange for the amount of time it takes to create content. I love blogging but sometimes I stop to ask myself why? What are you thoughts – do you feel the same sometimes? @Murissa, I thought with the sabbatical and having a full year off I would have “time” to concentrate on blogging, but as it turned out, that made it feel like work. I’ll be happy to go back to work and have the blog as a creative hobby where I have to prioritize and decide what to do with my limited time! I LOVE your design… I really need to work with someone new! Thank you for this comprehensive look into what’s worked for you- I need to be doing better! @Chelley, thank you so much for the compliment! I’ve had the design for quite awhile with just little iterations, every time I think want to change it, someone says how much they love it! Pinterest has been good to me, but I need to spend more time focusing on it in 2017. I still haven’t started using TailWind! @Crystal, I hear you! One thing at a time, right?! I do like Tailwind even though I am not using all its capabilities! Hi Andi! Very comprehensive post and loved getting a behind-the-scenes look. I use several of the same tools including Mailchimp. I like how you pointed out how important have a good, reliable host is. So many people sign up for cheap hosts not realizing what a mistake it can be when you get hacked and they do nothing to help. I found this out the hard way last year and shortly after switched to Siteground and haven’t looked back. @Diane, salut! I’m thankful nothing of that nature happened to me, my first hosting service was just unreliable, my site was down more often than it should be. I’m sorry to hear you didn’t have the same experience, but I am glad you are all better now! So nice to get a visit from you – merci! @Kristin, us Type-A types love our tools! Thanks for this roundup! I like keeping up with the tools other bloggers are using. We’re pretty much on the same page. I’ve been meaning to check out CloudFlare for a while, now I have another incentive. I’d add a Virtual Private Network for enhanced privacy and security online. It creates a more secure connection for you by connecting to websites through another, shared network rather than directly. This is essential in China to counter its Great Firewall, and I’ve found it helpful in any country that restricts access to certain websites, like Turkey. I’d be happy to recommend one I’ve been so happy with for years now that I’ve become their affiliate. @Peter, we actually use VyprVPN and it has worked out for the most part. I didn’t have it on my last trip to China and I remember the strange sense of panic when I couldn’t get to my website! These are such amazing tools. I have never used Evernote before I will for sure look into that. @Marie, I really like it for keeping notes plus it syncs between my phone and laptop (and iPad). I have been using tailwind lately for Pinterst and love it. I might try out board booster as well to see how I like it though. I have never been able to really figure out mailchimp though lol. @Jessi, there is so many things swirling around in our heads, it’s hard to sit down and concentrate to figure things out….or is that just me? I did a trial of Tailwind at the end of last year and loved it so I got the full year at the beginning of this year. Being able to schedule pins has helped my traffic tremendously. I have Mailchimp but haven’t spent a lot of time with it. It’s one of my goals for this year though. I’m going to try Peek and see what it says about my blog. Thanks for the tip! @Shani, I need to use Tailwind much more than I currently am, it’s never-ending, right?! Great post! I wish I read this before I started out. I had the hardest time picking a host and a platform and now my whole site is built on Wix and there are so many limitations that I’m starting to figure out. I might have to make the switch too! @Devon, I did the same thing early on for a business site. I loved it at first, but then could do everything I needed and ended up changing to WordPress. It’s so tough! Thank you for all this information! I use tailwind to schedule my Pinterest but I don’t schedule any of my other social media which I need to do as I’ve started back at my part time job and time is precious! I’m going to have a look at hootsuite and see how that works! @Lianne, to me Hootsuite and Buffer are godsend’s for a working girl! I love them! OH!! This is such good info! I need a blog designer as I’m getting ready to take my blog to a new level. @Christelle, the design process is so fun, I hope you find a good one! Great tips! I’m only just starting out so it’s nice to see how the pro’s do it 🙂 Have spent a few days trying to set up Hootsuite but always on the look out for a calendar or app that will help me organise my thoughts. @Kirsty, I hope Hootsuite works out for you, I love it! Thanks for sharing this! I am always on the lookout for new tools to improve my blogging. I just downloaded Grammarly and think I am going to love it!